Well, here it is, New Year's Eve again. It's very much a summer's day, the sun is shining, and cicadas are singing. 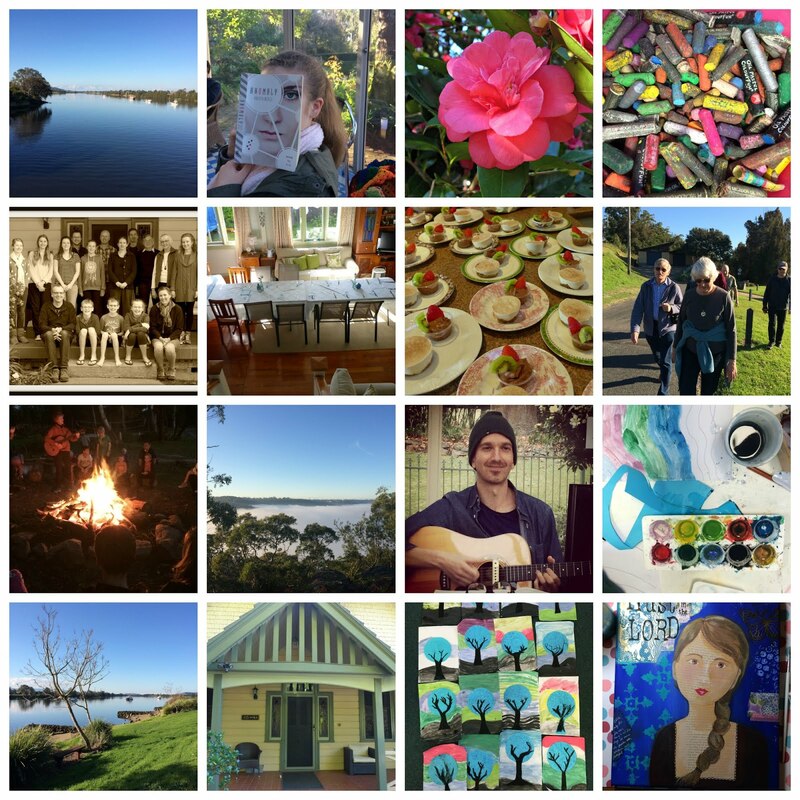 I haven't blogged so much this year, and for that I partly blame the iPhone. Because it's too easy to take photos on my phone rather than my camera, and to post them on Instagram if I want to share them. And because that's the way bloggers seem to have gone in the last few years, to Instagram. Plus, it's hard to use Blogger on the iphone. I even started a new wordpress blog during the year because it was easier to manage with the phone, but that fell by the wayside, too. Besides all that, it's been a busy year, with lots of good things, but also a few hard things to deal with. But I still love blogging, and the chance to write a bit more at length about life, minus the hashtags. 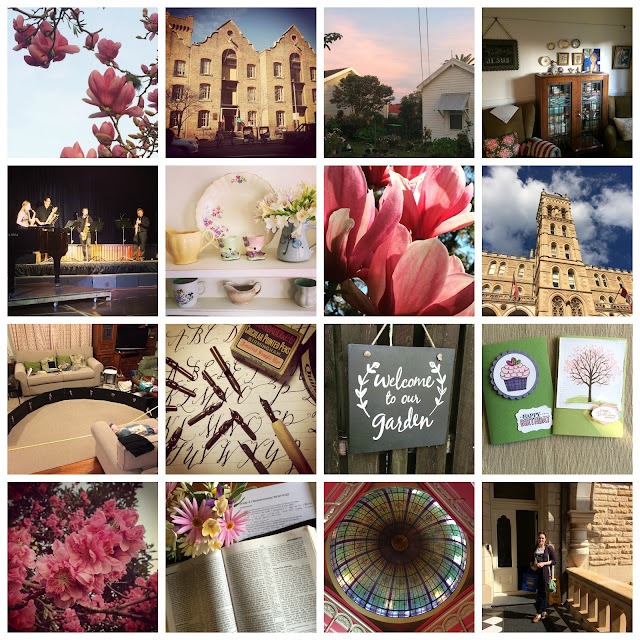 I'm expecting a busy year ahead, but am hoping to blog more regularly than this year, perhaps with shorter posts and few photos. 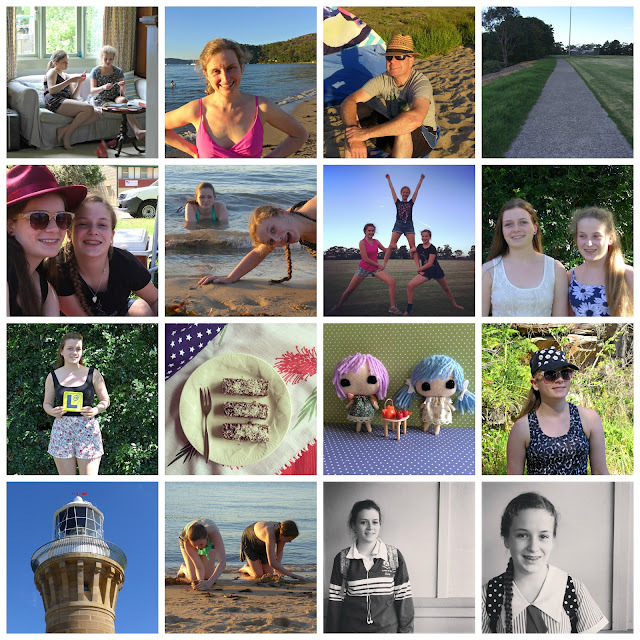 January : school holidays - plenty of time at home, with some crafts, but some nice outings too, including a day at Palm Beach, and a big family picnic on Australia Day (or thereabouts). Emily got her Ls, a year after she could have. I painted in an art journal. Our new minister started at church, along with his wife who I knew at school. And in the last days of January, the First Day of School, Emily's last-ever. February : Back to school routine, Emily busy doing her last year of school. 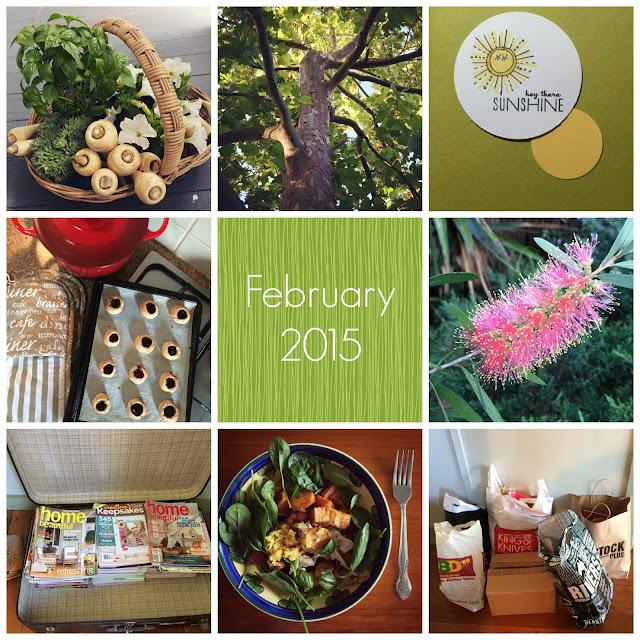 Apparently I had nothing to blog about in February. But I know I did some decluttering and organising for the year, and started teaching music and leading bible study for the year. Dietwise, I was eating very healthily but still having some digestive problems (too many nuts!). 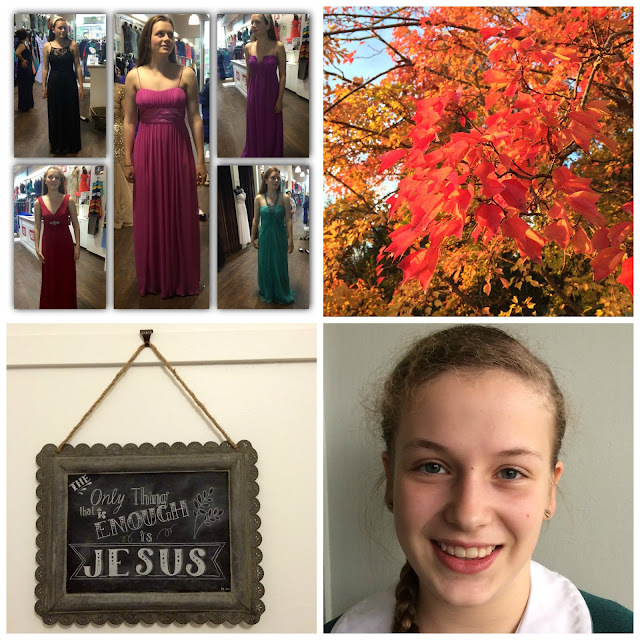 The girls both joined youth group at our old church, going every Friday and Sunday night, and Laura continued to iceskate every Saturday morning and do ballet on Thursday nights. I had about 10 piano students and two recorder classes at the local primary school. I resigned from Stampin' Up, after a very happy 6 years selling and (more often) buying stamps and craft supplies with them. 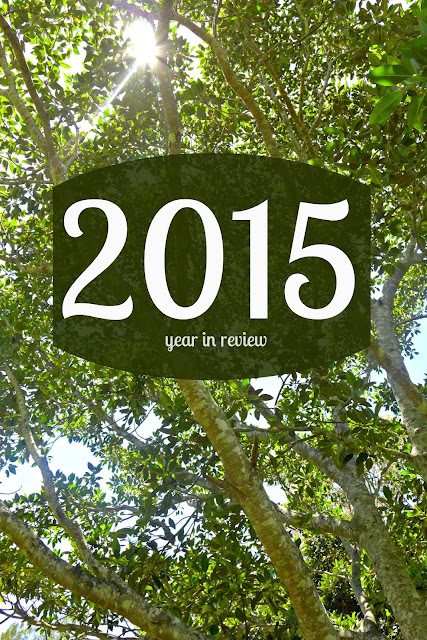 Our church started to grow, and continued to do so all year. March : We had another Japanese student, Akiko, come to stay. Akiko was lovely and we were very sorry to say goodbye to her. Sadly we have lost touch since her visit. After she left, I had a call from Steve's mum and before I knew it, was in the full throes of helping her clear out and sell her townhouse. With a huge family effort, we got her moved into an apartment at a retirement village and the townhouse sold at auction in April, phew. In this month my nutritionist put me on a super-strict gut-cleansing diet to finally solve my ongoing digestive issues - selected cooked vegetables, chicken, lamb, fish, eggs and tiny amounts of fruit were my only foods for a while. I lost more weight and felt good but restricted. It's hard to munch on cooked broccoli when others are eating cake ... however it finally did the trick, and over the months I was able to add more foods back in to my diet. Emily began rehearsing with accompanists for her music performance and worked at her art major work, in between doing all her other schoolwork. 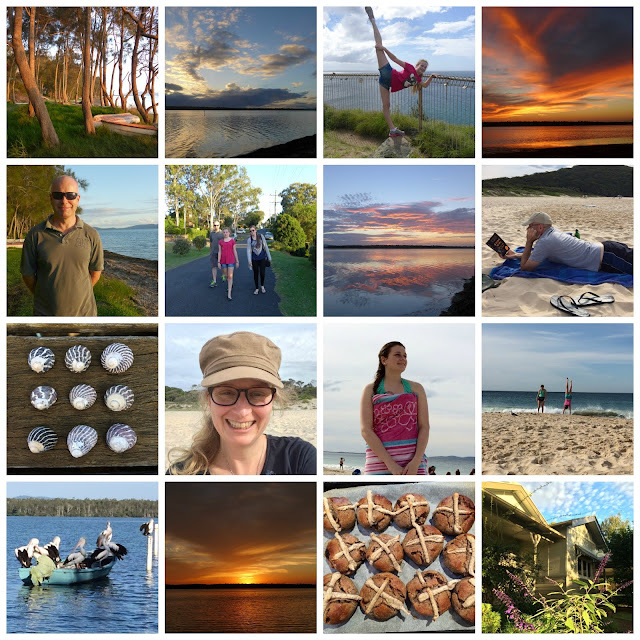 April : We had a great week at Green Point, near Forster. Beautiful scenery and plenty of time for relaxation. We also had a week at home and then it was back to school. I finally went around to the local schools to put my name down for casual teaching, something I'd been meaning to do ever since we finished our upstairs extension! (Up to then I had been teaching only at one local school, where I also teach recorder). May : The casual teaching started flowing in, sometimes in a trickle and sometimes as a downpour. Six of the 8 schools I had registered at called me this year for teaching, sometimes to teach Music, but mostly to teach general classrooms. I loved it, but it took some getting used to - being in a new environment each time; the stress of not knowing if I'd be called or not. Emily and I went shopping for a dress for her Yr 12 formal, and thankfully found the perfect dress that day. Laura got her braces off after two years, what a relief! Steve and I did some major decluttering of the workshop and shed so that the workshop could become a mancave. Later in the year we moved our laptops and desks out of the study to make it more of a music room rather than home office. The girls went to band camp. Emily, being in Yr 12, took on the responsibility of running all the entertainment for the 3 days. She enjoyed that so much that she has decided she would like to go into Events Management in the future. I chalked a sign at last on the beautiful frame my bible study gave me last year, reminding me that no matter how much I chase after things, or feelings, or achievements, only Jesus is really enough. June : More casual teaching. A good church weekend away, looking at Daniel and 1 Peter. Or perhaps 2 Peter. But excellent, in any case. We celebrated my Mum's birthday here with lots of family members over for lunch. 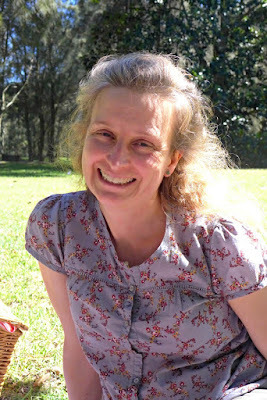 At the end of June we had a a few days away with my family at Nowra, which was great. July : Two weeks of school holidays. The first week was busy with Emily's HSC - driving her to rehearsals, travelling to Redfern twice to get photo printed professionally. The second week Steve's mum was diagnosed with cancer (for the second time in 6 months) and I took her to a lot of appointments. So it was really not a relaxing holiday for me (or Emily, or Steve's mum, of course). Steve's mum had surgery the following week, and a good recovery over the next months. We were thankful that she was taken care of at the retirement village and no longer has to cook or clean for herself, or care for her less-able husband. Laura began piano lessons with a "real" piano teacher. (As opposed to her mother, who is a real piano teacher but isn't treated like one by her daughter, and who sometimes forgets to teach her daughter altogether). I began rehearsing for a performance at a folk festival, and we celebrated my cousin's son's 1st birthday. 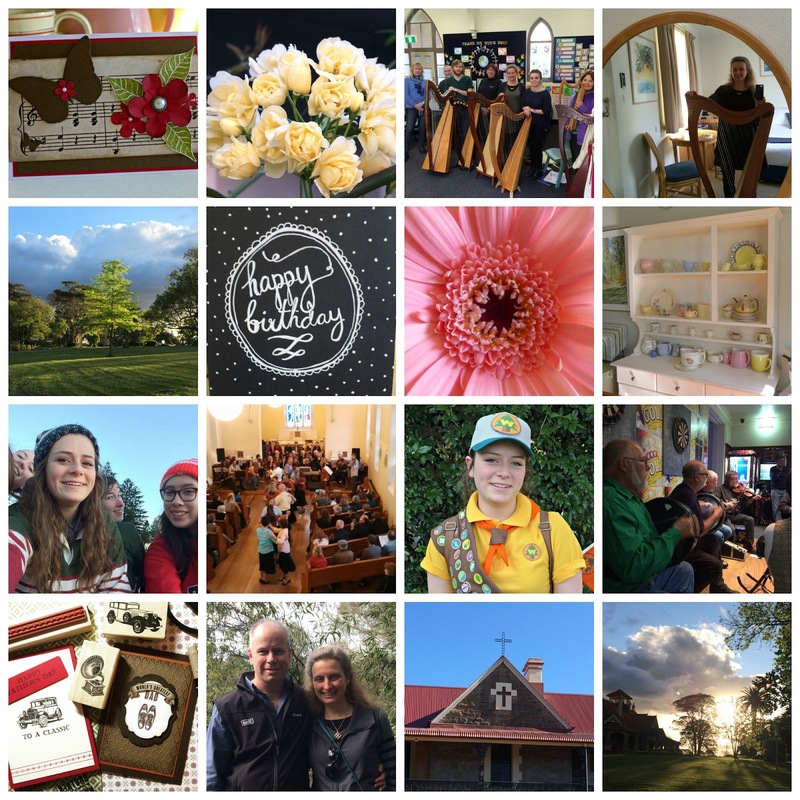 September : I had a lovely birthday. 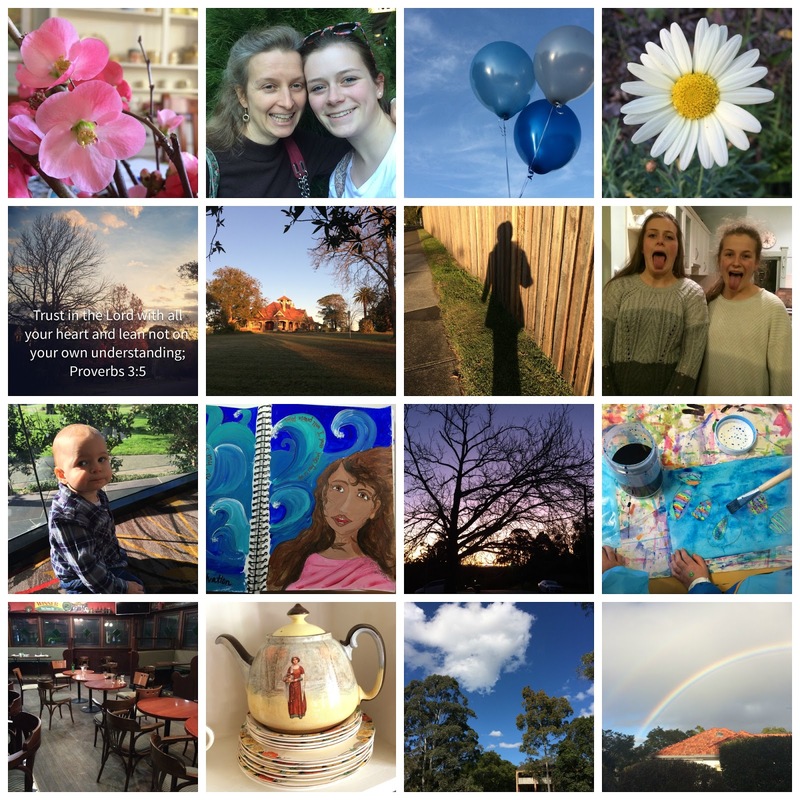 (Which was as far as I got blogging the last few months of the year) It was a very stressful month for Emily and us as she worked away on art and music and finishing other assessments. I had a fair amount of teaching, with 8 days at one school and random days at other schools, and began to research uni courses to do primary teaching. I made the decision to enrol at Charles Sturt Uni, where I can study entirely by distance in 2016. 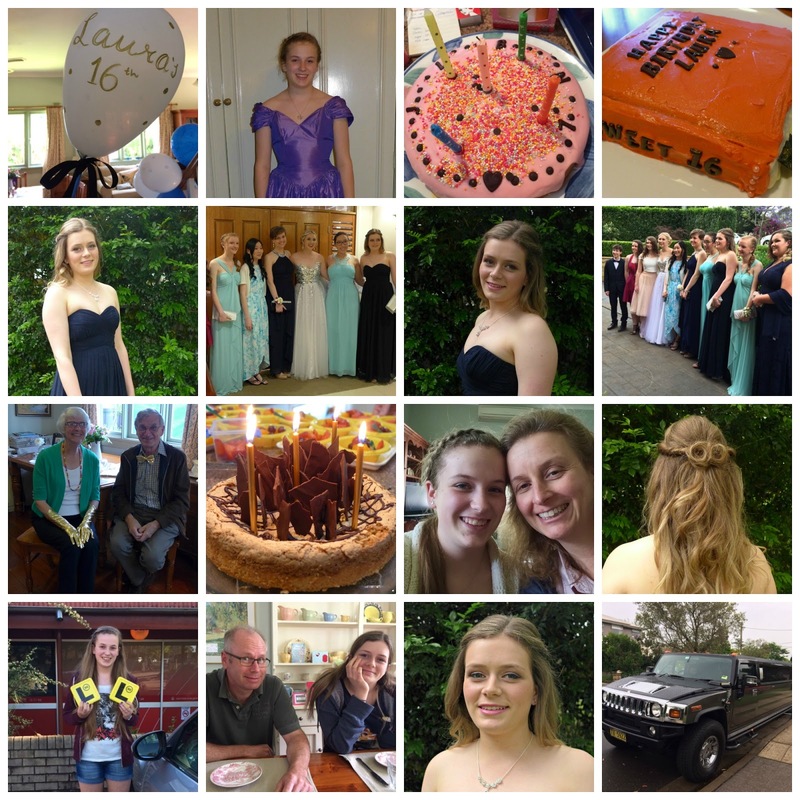 Finally everything of Emily's was handed in and she graduated from high school on 18th September, ready to spend the next 5 weeks studying before her HSC exams began. At this point I headed off to Yass to for my first ever public harp performance, playing in an orchestra for a performance at the Turning Wave Festival. It was totally nervewracking but also a breakthrough for me, as were the masterclasses by a visiting Irish harpist. Just getting myself to Yass was an achievement, really, for someone who doesn't venture much from home, and rarely alone. After that came two weeks of holidays. October : We had very quiet school holidays, with Emily studying hard. We girls did have one fun shopping and afternoon outing. The HSC began on October and Emily was there to the bitter end, with the last exam Visual Arts being on 5th November. And so we entered a new phase, in which Emily was home most of the time and Laura was the only one going to school regularly. 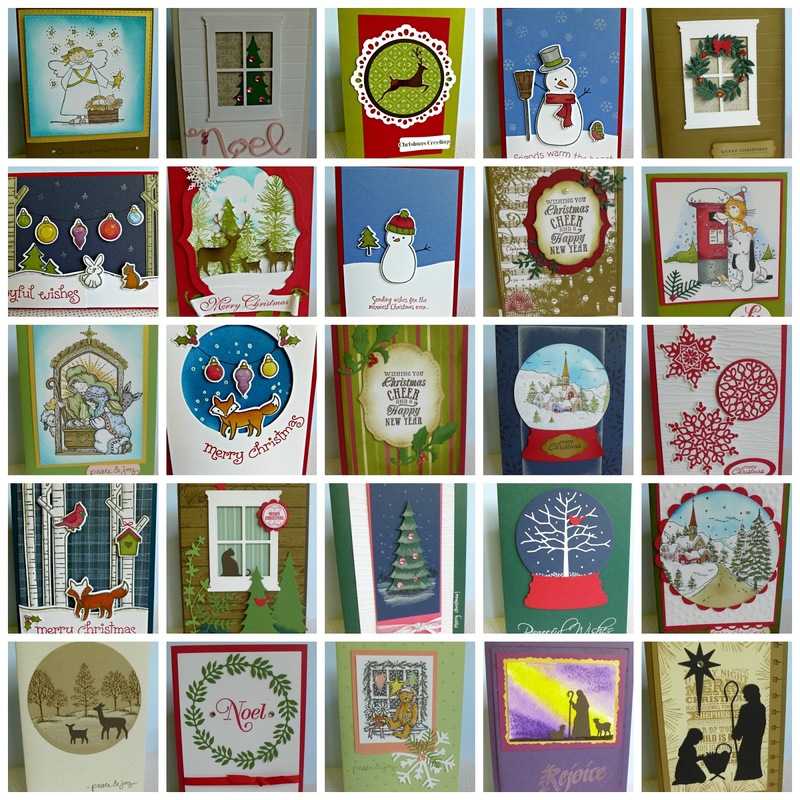 I began making Christmas cards, having not stamped much all year, and got hooked into coloring with Copic markers, going back to the local craft shop for a few more at a time. Steve's mum broke her wrist around this time, so she was back to hospital for the third time in 12 months, poor her. We are grateful to have many family members to help her at times like this, it seems that when one or more members of Steve's family are away or busy, 1-2 others will have more flexible time to help. 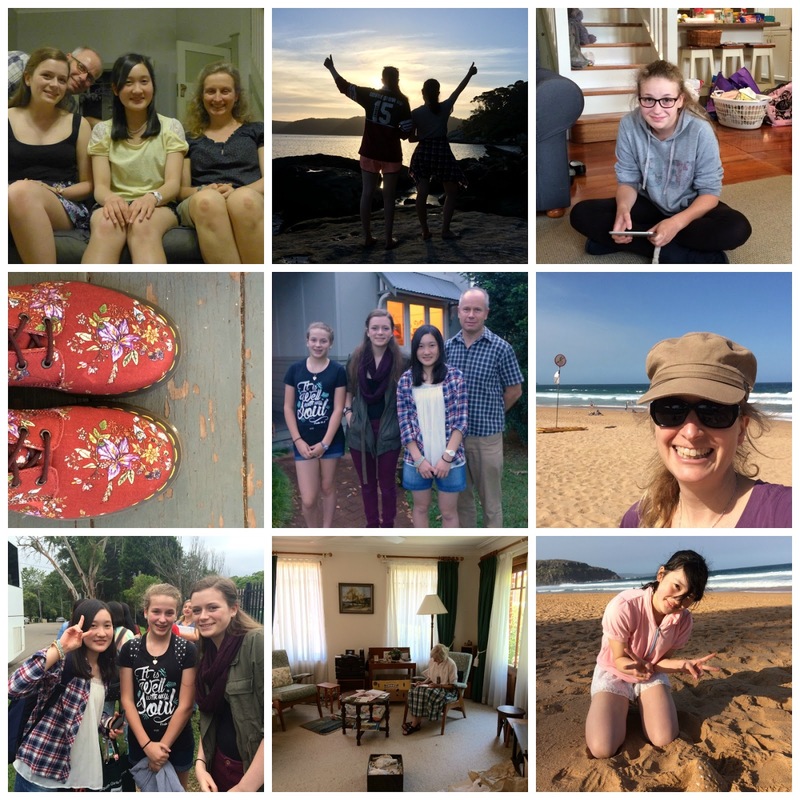 November : Emily was finally free of all school requirements in early November, and began to look forward to the Yr 12 Formal and her schoolies week with friends, at Port Macquarie. We had a family dinner out at the local Indian restaurant, to celebrate the end of the HSC. We organised hair and makeup and on the night of the formal Emily looked absolutely stunning. One of the mothers hosted a pre-formal party, to which parents were invited also, so I got to chat to some parents, some of whom I had never met before and will never see again, but others who have become friends over the past 5 or so years of party-pickups and girls visiting our home. Laura turned 16, and got her Ls. we had a book party for her 16th, and also celebrated my parents' golden anniversary and some family birthdays. I began a pre-uni Maths course, to brush up my maths in preparation for studying and teaching maths. I also spent a lot of time colouring Christmas cards, and pretty soon found myself having terrible headaches, neckaches, shoulder aches and eyestrain after so many hours at the computer or looking down shading tiny details. I basically had to use my eyes as little as possible, avoid the computer, and read for very short periods in certain poses only ... which was all very frustrating. Eventually I improved, thanks to my chiropractor Sara, who has helped me in so many ways this year, and to new glasses which I was finally able to get in mid-December. I had more casual teaching. Emily had a great week away with her friends, and got a casual job on the checkouts at Woolworths. December : It has been a lovely December, on the whole. Somehow the end-of-year didn't seem quite as crazy as usual, perhaps because the girls are growing up. Just a little casual teaching, and I wound up my year of piano and recorder teaching. My little "recorderlings" performed Frosty the Snowman beautifully, at the school carols night, complete with singing and choreography. From the morning of 1st December we had Christmas music playing, and I put up the decorations around the house slowly those first few days of the month. On the 5th we put up the tree and everything felt right at last to lead into Christmas! This year we extended our family Kris Kringle giving to the kids also, so there was even less gift shopping to do than in previous years. Steve had a work Christmas party at the Hydro Majestic, 1920s gangster-style. With my eyes still a problem I wrote my 80+ cards in small batches, and posted them with much relief around 10th December. We hosted a street party one night, and in the week before Christmas managed to do most of the traditional things (baking cookies, walking around streets with Christmas lights, seeing Santa on a firetruck) in between Emily working and days of rain. 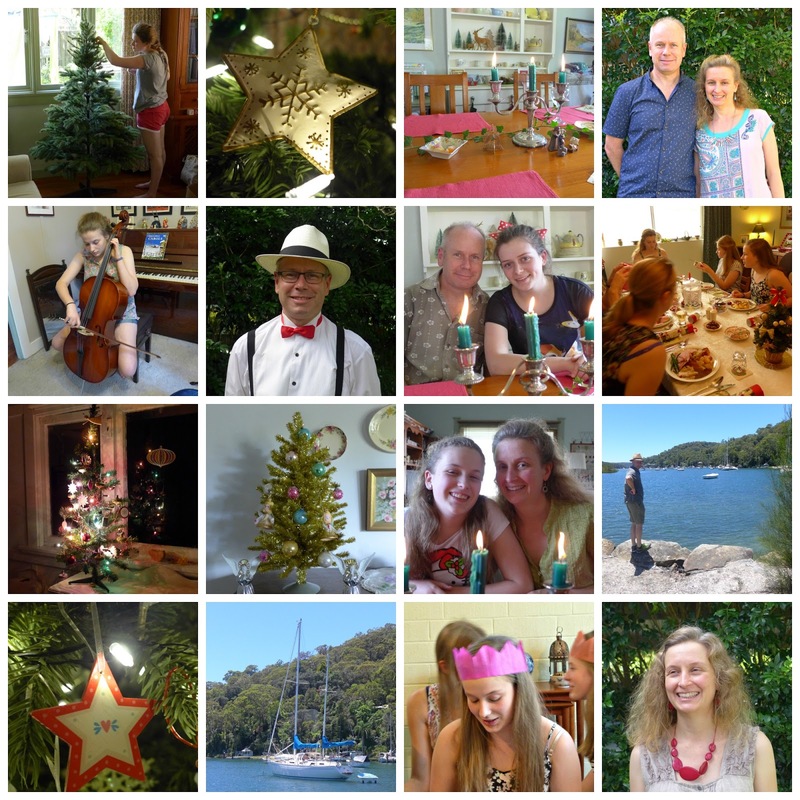 Christmas Day was lovely, with beautiful fresh mild sunshine, and due to a smaller family gathering this year, the main part of the day was calmer and quieter and more relaxed, all just perfect. 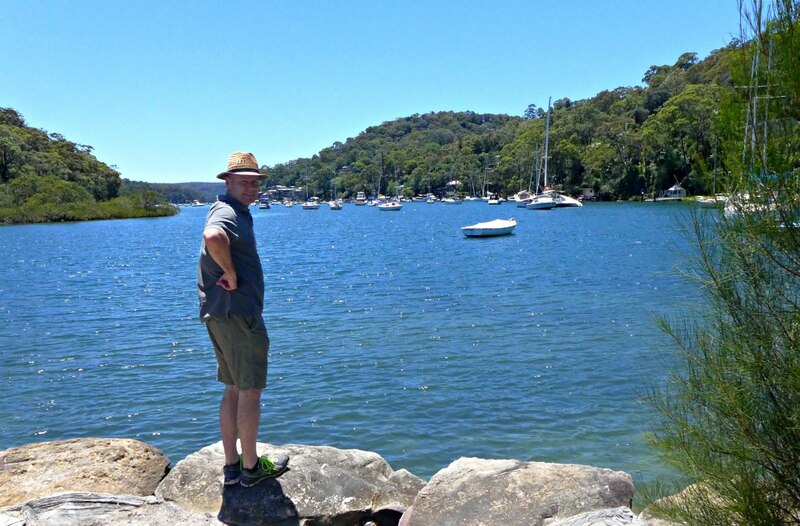 Since Christmas, we've been sitting around, reading and watching DVDs, or gardening, or doing household jobs (Steve), and yesterday we had a perfect picnic at McCarrs Creek Reserve. I've been able to get away with eating many more treats this year without dire results, including chocolate and dried fruits, which I haven't eaten much at all for over 5 years. So perhaps my earlier deprivations have done some good, after all. 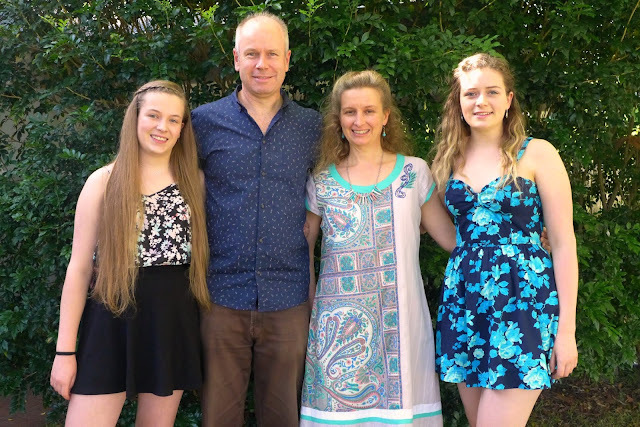 Emily got her HSC results, which were really quite good, early in December, but now is in a limbo phase, not knowing which course she will be doing until the uni places are offered on 20th January. She expects she won't get her first choice of uni course, but is already enrolled in a private college so she can always go ahead with that. So that brings us up to New Year's Eve. We'll be having a quiet one. Emily has worked this afternoon and we'll probably have a BBQ dinner then play some games or watch a movie. Christmas day portrait - nothing like setting up a tripod and self-timer as we rush out the door to church! Thanks for sticking through to the end of the world's longest blog post. 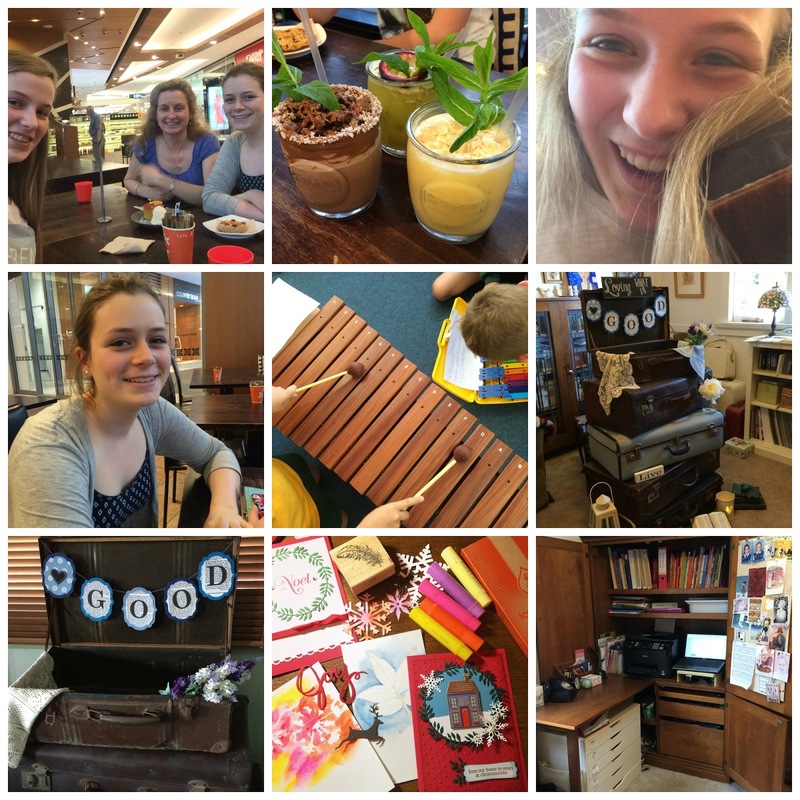 Since I don't seem to get any scrapbooking done either these days, this blog has become a record of our family life as well as my interests, and I felt the need to record our year here. Wishing you a wonderful 2016, dear readers, all two of you. Maybe three. Oh this was such a treat. Laura's hair has got so long, lovely. L's already! Hydro Majestic for a party, what fun. You have achieved a lot yet remained focused on Jesus. I have so enjoyed reading about your year. Some things I was happy to have known about, others were a surprise. I wonder what God has in stall for you this year?